Micheal Flaherty is the president of Walden Media, a company he co-founded with his former college roommate, Cary Granat, to produce films, books, and interactive programs that tie directly into school curricula. Acclaimed for such films as The Chronicles of Narnia: The Lion, The Witch and The Wardrobe, Charlotte’s Web, and Bridge to Terabithia, Walden Media aims to recapture imagination, rekindle curiosity, and demonstrate the rewards of learning. Producing both original works and adaptations of acclaimed children’s literature, Walden Media projects are enhanced by comprehensive outreach and supplemental programs for teachers, librarians, and parents. Upcoming releases include Mr. Magorium’s Wonder Emporium (2007), and The Water Horse: Legend of the Deep (2007). In 2001, Flaherty joined his Tufts University roommate, former president of Miramax’s Dimension Films Cary Granat, in founding Los Angeles based Walden Media, a subsidiary of The Anschutz Company. Walden Media seeks to marry the worlds of entertainment and education, offering audiences various ways to immerse themselves in the subject matter of its television, film, new media, and publishing products. As company president, Flaherty guides Walden’s vision across all business units. Flaherty lives in Lexington, Mass., with his wife, Kelly, his son, Christian, his daughters Eileen and Reagan, and his dog, Jumbo. Ethix: What brought you to Walden Films? Micheal Flaherty: I was working as an educational website developer at IBM by day. And I was doing some volunteer teaching in the evenings and on weekends. My interests were in the Internet and interactivity made possible by technology. I thought that technology, rather than a new textbook, could be the key to getting kids excited about learning. My former college roommate, Cary Granat, had had tremendous success in film as president of Dimension Films, but he wanted to start making films that his kids could enjoy as well. As we talked, we decided we wanted to start a company that would provide films that kids could watch and that would address the learning issues I was concerned about. I had just gotten married and I told my new wife that I wanted to quit my job and write a business plan! My wife was a schoolteacher, and she became the breadwinner while I learned how to write a business plan. From that business plan, Walden Media was born. I have never had a job for this long, and I am really enjoying what I am doing. I think there is tremendous potential with technology to give everyone an opportunity for a good education. You are born into a school system and no matter how hard your parents want to work at it, you are going to that school even if it’s a bad fit. And a good education can make all the difference. We are making a film right now called The Miracle of St. Anthony, about a Catholic school in Jersey City that has one of the lowest per capita incomes among its families. But it has one of the best basketball teams in the entire country, and over the last 20 or so years all but one of those players have gone to college. It is just a great story about two nuns and a great coach, Bob Hurley, who dedicated their lives to giving these kids a first-rate education. So for me it is really exciting to think of giving kids the opportunity to learn more about great stories. So much is happening right now technologically. It will be interesting to continue to think of ways to use that to help kids learn and grow. How do you see that technology being used to address films and learning? It is going to give more people the access to great films. It can reduce the cost of making films, as well as marketing and distributing them. So it is exciting to see more films being made and more stories being told. It also makes possible a dialogue that is not always pleasant, but that introduces accountability into the system. We can know what is on people’s minds and what kind of films they want to see made. We are making a film called The Seeker, and the people who love the book Dark Star Rising have let us know very clearly what they want to see in the film. What is your approach to finding a new movie? We just go out and talk to as many parents, teachers, and librarians as possible to ask them about their favorite stories. What kind of movies would you like to see? Traditionally what Hollywood would do is to decide for themselves what movies they are going to make and then try to figure out a way to sell them. We do it backwards, by first finding out what people want to see and then making the film. But you don’t make just any film. How do you define your niche? The overwhelming majority of our films are based on either great books or great people, so we don’t have a broad general mandate like most other companies. Ours is a very specific one, finding mostly great books, and some great individuals like Ray Charles [produced by Walden Media sister company Bristol Bay Productions], and then building comprehensive educational campaigns around the films. We are in our comfort zone with books, but it was nice to get some relationships going with music teachers around the country through the Ray Charles work. Tell us more about what you did with Ray Charles. We created an educational program around the music of Ray Charles, trying to get kids interested in this kind of creative expression. This was something we did for the classroom, making this tool available to the teachers. As you consider a project, do you focus on what you are for, or what you are against? Entirely what we’re for. For us it is always about finding great stories that the whole family will enjoy. Our goal is to inspire and get kids reading. We will leave the criticism to the critics. Others produce films that you would never produce. Do you see an important place for them as well? Certainly. There are a lot of films that we would never produce that are on my list of all-time favorites. For example, Saving Private Ryan is one of the best films I have ever seen. We’d never make a film like that because it carries an R rating and has intense violence. So it wouldn’t fit our family profile. But it’s a terrific film, and I think it’s fantastic that it was made. I had just gotten married, and I told my new wife that I wanted to quit my job and write a business plan! Brave Heart is another one of my favorites. Also, I am a sucker for films that connect people with reading. So one of my favorites is The Warriors. At one level it’s a film about gangs in New York. But the inspiration for that film is The Odyssey, and once you get to know that film, which is a very popular film nowadays on DVD, that is the back door to reading The Odyssey. That’s how I got into the book in high school. What is the relationship between a good book and a good movie? In both cases, they help you appreciate life, and they both help you understand that your best days can still be ahead of you. But a book and a movie are very different things. It is no slight if someone tells us that they liked the book better, because we are not competing with the book. In fact, if the film gets people to read, then we believe we have accomplished part of our mission. You have produced a special issue of Charlotte’s Web after the movie came out, including a teacher’s edition. Is this another part of your link between books and movies? Yes, we are doing this in conjunction with the publishers, creating guides that are independent of the movie. We try to gear everything toward the book rather than the film. We will use the images from the film as illustrations, but everything is geared toward the book and the story. We just want to make sure that it is something that teachers will use. We distribute the guides at a lot of conferences — the American Library Association conference, the midwinter librarian conference, and a number of teacher’s conference. We are always there, passing out the guides and copies of the books. In the case of Charlotte’s Web, we get zero profit out of all those books. The publishers love us because it is literally free marketing for the books. Of course,Charlotte’s Web has been a perennial top seller, but for some of these other ones, like Bridge to Terabithia, the film and our promotion made a big difference. Why is reading so important to you? Literacy and a love for literature is the gateway to learning. Many are talking about the big crisis that we have in education, but for me it all starts with reading. If our young people don’t have that passion and love for literature and for great stories, a lot more than reading could perish. Did you know that those who read have a greater likelihood to be engaged in their communities? They are more likely to volunteer and to engage in the arts. So I believe that reading is critical for a democratic society. I think there is tremendous potential with technology to give everyone an opportunity for a good education. This is all documented in a study done by the National Association of School Boards of Education (NASBE) that published a report titled Reading at Risk. You can find it on the web. It was the first comprehensive study that I am aware of showing the direct link between reading and behavior. In addition to that, it showed that for the first time since they have been measuring these things, fewer than half of the people in the United States have read a single book for pleasure in the last year. This is a passion of mine, and our connection between making films and reading. How does the financial part of your business fit with the motivation you have been describing? We are definitely a double bottom-line company. If our movies aren’t profitable, then we can’t keep making them, and that is the critical thing for us. You can do well by doing good. And we encourage imitators. If we can prove that making films based on these kinds of stories is profitable, then there will be more of these films available for families to see. So we really feel the responsibility to prove that this kind of venture can be profitable. When you talk about a double bottom line, does it ever pull you toward a project that doesn’t quite fit your values, but could make a lot of money? No, but there are a lot of those! Sometimes we get pulled in the opposite direction. We see a story that could be a real challenge to make money with, but we still feel it is an important project. We tend to go for it because of the story first. That was the case for the two films that came out within a week of each other, Bridge to Terabithia and Amazing Grace [produced by Bristol Bay Productions]. Bridge to Terabithia was a terrific book written by one of my favorite authors, Katherine Paterson. But it was very challenging, and a lot of traditional Hollywood folks passed on the film because they thought it was too much of a downer. We saw something different, a book that kids had enjoyed for several decades. So we went ahead and made the film. Walt Disney, who has been a terrific partner with us in marketing The Lion, The Witch, and the Wardrobe, and Holes, did the marketing. They took a real chance for us on that one. So it was especially rewarding to see that film do so well financially. I think it made over $80 million in the U.S. and then another $40 or $50 million abroad, and the film only cost $20 million. So that one was a real success for us that no one expected. Walden Media headquarters in Boston, Mass. I personally enjoyed Amazing Grace. How did that film do for you financially? It did great for that kind of picture, as a historical drama or period piece about William Wilberforce and his work in England to abolish slavery. Another film in that genre came out in the same year, The Last King of Scotland. It won an Academy Award, but Amazing Grace made more money, and it is doing really well internationally. There is a more important, more gratifying thing to come out of that film, however. We hired an independent polling company to do an objective poll for us several months before the film came out, testing the knowledge of William Wilberforce in the United States. The poll was repeated several months after the film came out and showed that the awareness on William Wilberforce in the U.S. increased substantially. This was very gratifying, because it showed we could make money while doing something that fit our values. Yes. One of the big things we do is look at book sales to see if our film “moved the needle” in terms of getting people to read this specific story. In all of the cases of recent films, including Holes, Because of Winn-Dixie, The Lion, the Witch, and the Wardrobe, Bridge to Terabithia, and Charlotte’s Web, we have seen the sales of those books increase exponentially. So we do know that we are getting more people not just into the movie theatre, but also to read the story. Further, we hope that if we introduce somebody to Charlotte’s Web, that now they will read all of E.B. White, or all of Kate DiCamillo if they like Because of Winn-Dixie. When we released The Lion, the Witch, and the Wardrobe, not only did sales increase with the rest of the Chronicles of Narniaseries, but they also increased with all of the C.S. Lewis titles. Fewer than half of the people in the United states have read a single book for pleasure in the last year. So it isn’t just about the financial side, but it is measurable progress in getting people to read good stories. This has now gotten us into publishing original books. The film industry has an interesting business model. For example, many of the people who make a film do not work directly for Walden Media, is that correct? Yes, they all do. But they work on a project-by-project basis. Each film is its own business that we operate and manage. We have a full-time staff of about 70 people to identify and develop projects and to market the films. Our staff also develops partner relationships, and does administration and the back-office thing. But when we start a project, the number of people can grow to thousands. Each of these people work for us on that particular project. We have never had a year like the one coming up, with movie releases in October, November, December, April, May, and August. And the August film will likely move up. Concurrently we have a number of books in the pipeline. So we went from having about one or two products per year, to our present schedule. It is a sign of a market need. It is also a sign of our growth and a new distribution partnership with Fox. So now, with the exception of the Chronicles of Narnia series, all future movies will be distributed through a co-venture with Fox to market and release films. It has been really exciting to have that expertise in house. Disney will continue with marketing and distribution of the Narnia series. We have a joint venture with Penguin Publishers to co-publish books. We have a series coming out in a couple of weeks by Mike Lupica, a sport columnist who writes books for young boys. This is a group we would like to inspire to do more reading. We also published a book called The White Giraffe, which takes place in South Africa. There is a lot of ignorance about Africa in the U.S., and not just among young kids. This book is both a terrific story and teaches about Africa. The team that did Bridge to Terabithia is on board to make the movie based on that book. Another book is Simon Bloom, The Gravity Keeper. That is fun because it was written by a first-time author. It’s a cool story about a physics book that falls out of the sky and hits a kid in the head. He learns to control the laws of physics in such a way that makes mathematics and science seem a lot more tangible and relevant to kids’ lives. Universal Studios actually beat us to the punch, gaining the rights to make the movie. But again, we are just happy that someone is making this film. Editor’s note: My 11-year-old grandson, Chandler, read the book and said this will make a terrific movie. Most media companies are located in Southern California, but you are here in Boston, Massachusetts. Why? 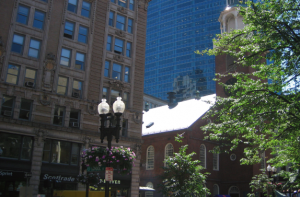 We have two offices, one in Southern California and one here in Boston. You can see video-conferencing equipment there in the corner that gets quite a bit of use. We have a much bigger office in Los Angeles, managed by Cary, my former college roommate. We go back and forth to L.A. and we are on video conference and conference calls several times a day. But I just like being in Boston for a couple of reasons. First, my brother, Chip, is the executive vice president and publisher, managing the book side of our business that is located here. Second, we like being close to so many great universities. We have a great intern program with the colleges in the greater Boston area, including Tufts where both Cary I went to college. I remember reading somewhere that you do not follow the traditional grand style of travel like some other media companies do. It comes from spending a year after the dot-com bust of trying to raise money and spending money carefully, like it was your own. When we first started, it was with the money my wife and I got from our wedding. So we would go online and find the best price for a hotel, and shop carefully for the best price on a rental car. There is no reason not to continue to apply that just because we are now making good money. It has become a part of our culture, and is actually a lot of fun. It starts with our chairman and primary funder, Phil Anschutz. This is the way he travels as well. He sets the example. Of course, we wouldn’t mind the occasional night at Shutters in Hollywood! What is coming up in your future products? Prince Caspian is next in the Chronicles of Narnia series. Everyone seems to remember reading that series growing up. Many people think of reading as a solitary experience, but at least with this series, people remember the books being given to them by a friend and being read to them. Great stories are shared. That will be coming out in May. Then the following May, Voyage of the Dawn Treader comes out. We are very excited about those films. Right around that time, we also release a book written by a first-time author, Ingrid Law, called Savvy. The manuscript came out a few months ago, and everyone who has read this is betting on it. We believe she is at the beginning of what is going to be a long career for her. Savvy is a beautiful book about a young girl whose family discovers supernatural talents on their 13th birthdays. The story is about what happens on the eve of her 13th birthday. Do you plan to do all the Chronicles of Narnia series? Right now we are committed to all of them, but currently we are focused on only the next two. One of the challenges we face in a long series is the aging of the children. In the stories, they reappear in the last book, The Last Battle, at the same age they were in the first story. Andrew Adamson, our director, has a great way of dealing with the aging of the children within the films. And Douglas Gresham, the stepson of C.S. Lewis, has an encyclopedic knowledge of all things Narnia, and has played a critical role in these films. We won’t get to The Last Battle for 10 to 15 years, and we will have to find a way to deal with these challenges. The overwhelming majority of our films are based on either great books or great people. What would you regard as the biggest success of the films you have done? Definitely it was Holes, our first film. People were scratching their heads when we first started. They thought our business model was absurd. They also didn’t agree with our definition of family films, because Holes takes place in a juvenile detention center and it definitely has some edgy themes to it. Some thought that to be successful as a family film, it had to be Pollyannaish, but it was great for us to show a film that the whole family could enjoy that still dealt with some major issues. But it had the themes of redemption and reconciliation shining through. It was a double bottom-line success. We were able to identify themes that kids and parents were interested in, and that were effectively under a lot of people’s radar. And it also did well financially. Have you had any films that came out exactly as you had envisioned them? Yes. But a personal favorite is Because of Winn-Dixie, based on a book by Kate DiCamillo. She is truly my favorite writer. It’s a big day in our house when one of her books comes out. I have learned a lot about storytelling from Kate DiCamillo, and it was great just to get to know her. It has also been great to work with Anna Sophia, who is the girl in Dixie. That was her first big movie and then she went on to star in Bridge to Terabithia for us. She is a great actress, and we will be doing lots more films with her. Another great story Kate wrote is Tale of Despereaux. This is a wonderful story of forgiveness that will also come out as a movie, though unfortunately not from us. It will be out December 2008 with the screenplay and direction of Gary Ross, who wrote and directed Seabiscuit. It is definitely one of the best books I have ever read and I cannot wait for that movie. Did you have any projects where you said, well, that was a good idea, but it didn’t make it? If the film gets people to read, then we believe we have accomplished part of our mission. You always have those kinds of disappointments. I don’t want to talk negatively about any of our films, but we have learned that they are less successful (by any of our measures) when we stray too far from the original story. What is your toughest management decision? We have a board. So I am trying to think if I have ever even made an individual decision. That is not even false modesty! What are some cultural aspects the people in your organization would identify? Have you tried to establish a particular kind of culture here? That’s a good point. I work hard at establishing the right culture here, but then I always find myself contradicting it or setting a poor example! We definitely try to have a real casual, collaborative atmosphere. We have recently made the decision to move from these offices just because I believe even the physical layout tends to isolate people in their offices. We are trying to move to something that is more open space and that has more areas for spontaneous conversations to happen. Even with our intern program, we invite the interns to a lot of meetings with us. We get a lot of great ideas from them. So we are trying to establish, and not really succeeding at, as open a culture as possible here, to get as many people talking as possible. But it is interesting. You would think that would be the easiest thing, but you have to be completely deliberate. I agree that establishing culture is very difficult. And that the definition of your culture should include how you deal with mistakes. You can say, “I won’t make mistakes,” but of course you will. How does your family fit in with what you do? I have three children: Christian is 6, Eileen is 5, and Reagan is 2. They are just starting to enjoy the films. The first movie we saw together as a family was Charlotte’s Web, and that was fun. We saw it in New York. My wife is from Brooklyn, so all the friends that she grew up with in Brooklyn brought their kids. We were all there in Times Square. It was just a perfect night. And didn’t your wife suggest books to you? Is that where some of your ideas came from? Absolutely. She had used Bridge to Terabithia with her students and suggested it. She has been a terrific source of content. I am about halfway through several different books. But I read Goodnight Moon, and that kind of thing, to my children, and lots of books for Walden. Do you have a vision for what Walden Media might look like in 10 years? I want the Walden name to become symbolic of experiences that the whole family can enjoy. So whether it is a book or Walden.com or someone looking through the 7,000 cable channels they have, if they see that Walden name, they will know it is differentiated from all the other content that is out there. Mr. Flaherty recently spoke at BYU where I’m attending and I was very impressed. I hope Walden Media is wildly successful. There are many movies that I won’t watch, but I will watch all of Walden Media movies. Thanks for adding to the world! Just watched a video on the BYU Channel of your talk to BYU students which you gave some time ago. It is wonderful! And timely! I will now actively look for every film you and your company has made because of what you represent. I am old and have come to a point in life that I watch very few movies because there are hardly any worth watching as most contain no morals, no ethics, no honor etc etc ….in other words my time is precious and I refuse to waste it on anything worthless. I have seen Amazing Grace multiple times and I believe that that movie is a gem above gems. Absolutely magnificent! Can’t wait to see what you do next!